Minor updates are made to the site daily. The list below shows major updates only. The McLaren M16C was the most successful of the M16 variants, with works driver Johnny Rutherford winning eight races in M16Cs, including both the Indianapolis 500 and the Pocono 500 in 1974. Lola built two new four-wheel-drive Lola T152s for 1969, but USAC's rule changes meant that the two cars were hardly used after that season's Indianapolis 500. An extensive interview, quite probably the first in English, with one of the quickest and most talented of the late 1980's and early 1990's drivers in Formula 1; Stefano Modena. Tony Southgate produced a new car for Teddy Yip's team for 1982, the Theodore TY02. Despite a series of improvements to sidepods and suspension, the underfunded little team could not compete, and ended the season without finishing a single race. Ferrari introduced a new 'Boxer' flat-12 engine for 1970, and built a new car for it, the Ferrari 312B. Jacky Ickx, Clay Regazzoni and Mario Andretti won five GPs out of six from the 1970 Austrian GP onwards. 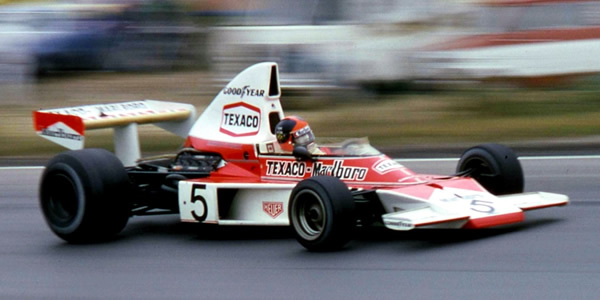 The "interim" March 761B was not a great car, despite Ian Scheckter's best efforts. Four were built, and two survive, one of which is on display in six-wheel form in the Louwman Museum in the Netherlands. Sometimes, when a car's history is disputed, it is necessary to go through its history in detail, to separate fact from fiction. Here is the detailed story of Lola T330 chassis HU24. All comments, additions and corrections are most welcome. The 1974 Formula 5000 Trojan T102 was such a disaster, it ended Trojan's customer racing car business. Ron Tauranac and Patrick Head were responsible for the design. Keith Holland was the unfortunate driver. Lyle Forsgren built two or three F5000 cars in 1969 and 1970. He kindly helped put this history together. Chas Beattie Projects built a monocoque Formula 5000 car for Lingard Goulding for 1970, utilising the running gear and engine from Goulding's crashed Lola T142. The car was destroyed in an accident the following year. MRD's burgeoning relationship with Fred Opert in the US led to a run of Formula B Brabham BT21As being built for 1967. This consisted of the new Formula 3 BT21 chassis fitted with a Ford twin cam engine. All the results from Formula 2 in 1972, with chassis numbers, engine specifications, engine builders, whether they were iron block or alloy, and even capacities. Enjoy! Swiss driver Jon Beekhuis won the 1988 ARS championship, but Tommy Byrne was the star of the season, winning three races. The SCCA points system valued Beekhuis' regular fourth and fifth place finishes more highly. Tommy Byrne had six pole positions, led seven races, won four and was leading the final race of the season until a back marker spun right in front of him. Mike Groff took the title. The Brabham BT43 was MRD's 1973 Formula 5000 design, and turned out to be the last ever Brabham customer car. It was not a success in the UK, but did achieve some decent results later in Australia. The Brabham BT31 was a slimline Tasman car, based on the Brabham BT28 Formula 3 chassis. It only raced twice, Jack Brabham finishing third in the Sandown Park Tasman race in March 1969, and then winning a Gold Star race at Bathurst. Tony Kitchiner built four cars in 1969 and 1970, three of which were used in Formula 5000 form at one time or another. Ian Ashley and Gordon Spice were among the drivers. After the McKee Mk 8 had proved a capable car in Formula A, Can-Am constructor Bob McKee also built a one-off USAC car for wealthy Chicago racer Hamilton Vose III, powered by a 5-litre Chevrolet V8. The 1972 F2 Brabham BT38 was based on the 1971 BT36, but was a monocoque instead of a spaceframe. MRD records state 16 were built, but there is evidence of 19 or 20 cars being raced. The French F3 series remained a backwater in 1981, with leading French drivers focusing on the European series. Philippe Streiff found time to pick up the title. The Merzario A3 was the least successful of Arturo Merzario's four F1 cars, and never qualified for or started a race. Nominally a ground-effect car, it was built up from an earlier car and was too wide and too heavy to be effective. After its difficult birth in 1979, the French F3 championship was a little better supported in 1980. Alain Ferté won the title in Alain Prost's 1979 car. After the success of his spaceframe 1965 car, Rolla Vollstedt built a pair of monocoque cars for the 1966 season. Both cars raced well into the 1970s. Red LeGrand's second Formula A design, the LeGrand Mk 11, first appeared in September 1969 and Rex Ramsey won a Canadian championship race in it at Trois-Rivières. One of the first "wing car" designs after the Lotus 78 was Tony Southgate's 1978 Shadow DN9. He left before it raced to design the virtually identical Arrows FA1 for his new team. John Baldwin joined Shadow to develop the DN9. OldRacingCars.com does not guarantee the accuracy or completeness of the information on this site and disclaims any implied warranties with regard to it. OldRacingCars.com shall have no liability for any loss or damage suffered as a result of relying on the information on this site which may prove to be inaccurate or incomplete. The aim of OldRacingCars.com is to provide owners and historians with the fullest possible resource for tracing the lives of the major post-war single-seater and sports racing cars.